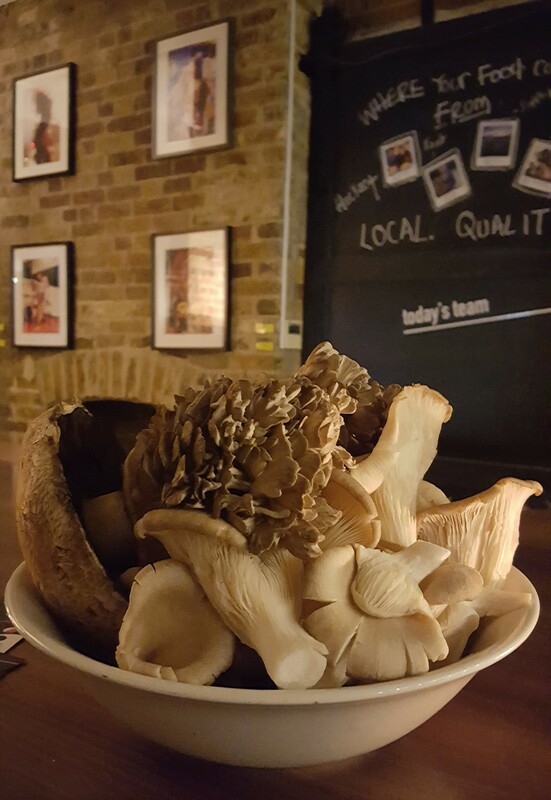 Mushrooms are a marvellous ingredient in spite of being categorised as the “fleshy, spore-bearing fruiting body of a fungus” on Wikipedia. They very rarely appear on my food shopping list, though, and if they do somehow find their way into my trolley, their general fate is to be finely sliced, lightly tossed in butter, smothered with grated cheese then grilled. There’s no denying that mushrooms and cheese make a harmonious marriage, but these flavoursome fungi can also be partnered with other complementary ingredients, which is what food journalist, recipe writer and supper club host Liz O’Keefe is keen to demonstrate at her Seasonal Dinner Parties’ Supper Club (we met at a Comté cheese tasting event, ironically). At each supper club, she takes the best available mushrooms of the season and skilfully highlights their versatility. 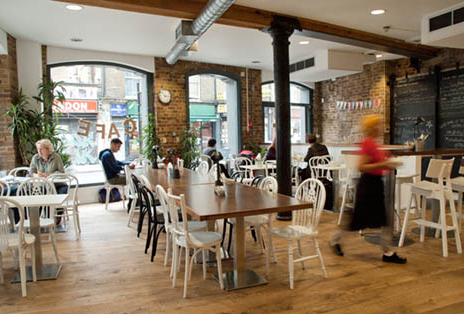 Wanting to broaden my culinary repertoire, I accepted her kind invitation to attend the final supper club of the year, “A Winter Mushroom Feast”, at Café from Crisis in Aldgate, which also the venue for the spring and summer events. All proceeds from the evenings are donated to Crisis, a charity helping to integrate homeless people back into society. Producers also play their part by donating or heavily discounting their produce for this worthy cause. 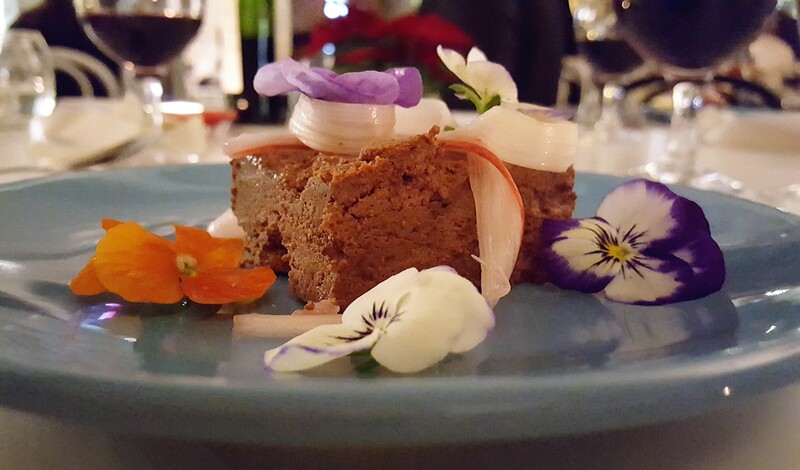 The 7-course tasting menu (£45) is predominantly vegetarian, with a meat main course. This can be replaced with a vegetarian-friendly alternative, and menus free from gluten, dairy and wheat are also provided on request. 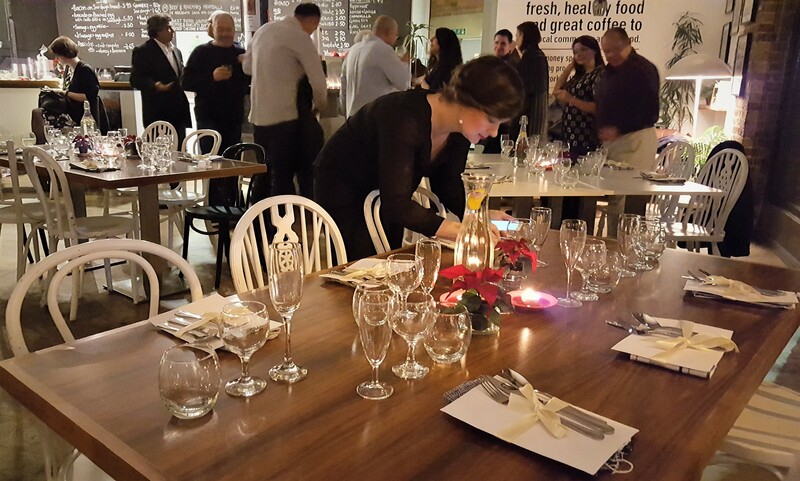 Each course is paired with an alcoholic drink, with non-alcoholic options available. My food partner in crime aka plus one was my friend RP, and both of us chose the non-vegetarian menu with alcohol pairings (“What else?” to borrow from Mr George Clooney). Our welcome cocktail of Black Cow vodka, tonic and nettle was a refreshing start to the meal. We sauntered over to our seats and were joined by food blogger Tash from Food I Fancy and food writer Lucy Blackwell. 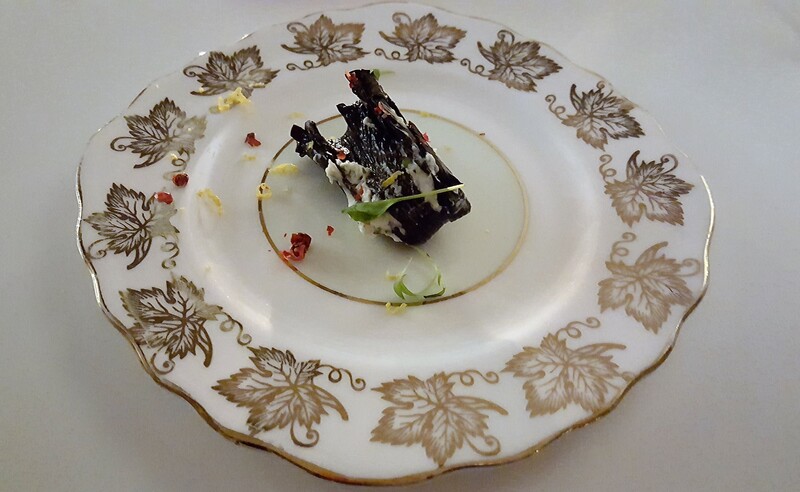 The amuse-bouche arrived as we were nattering away: Trumpet of cheese, served with Castlebrook sparkling wine. As you already know, I do love when mushrooms and cheese meet, and this was a generous amount of cheese with a pleasing citric backnote. Fruity wine was light and therefore a good match with the dish. 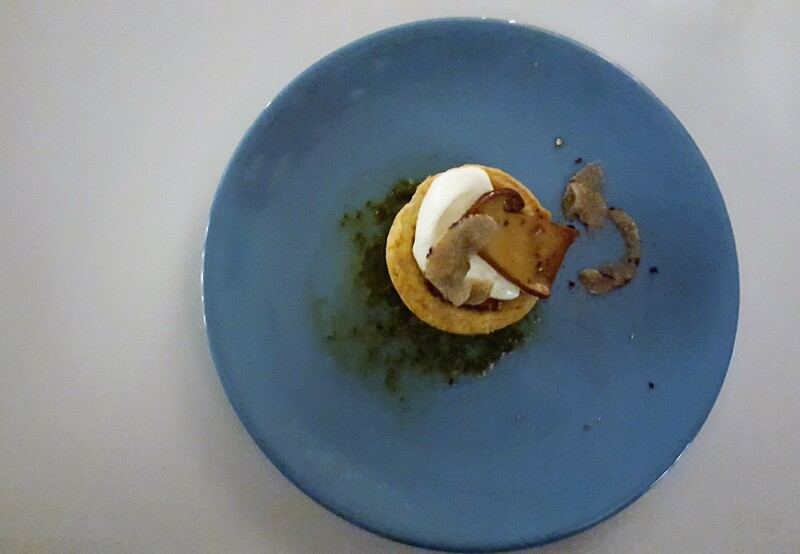 Next up was a porcini, garlic, nettle and black truffle tartlet: a beautiful combination of flavours and nicely presented. Again, the dairy component was plentiful, so a few more slices of porcini would work well. Salads tend to be synonymous with long, lazy and sunny summer days. This being November in East London, I was curious to see what the Winter Salad had in store. Instead of blue skies, ruby-red tomatoes and emerald-green leaves, we were given a medley of mushrooms on a sky-blue plate. 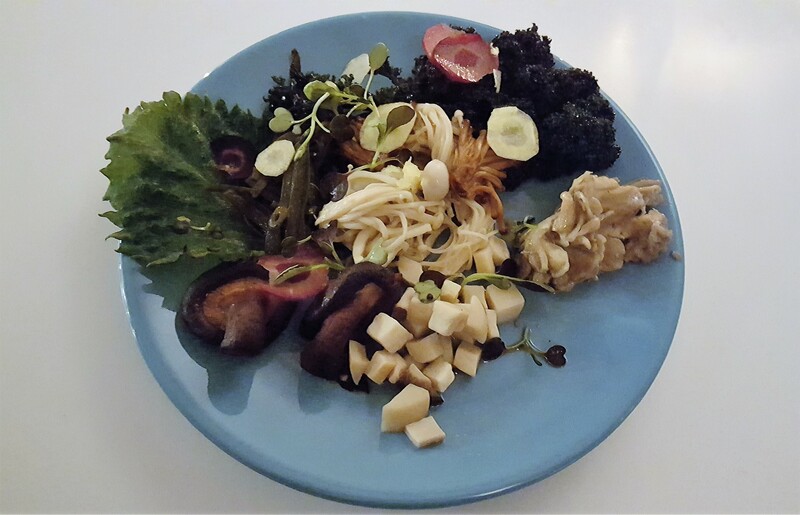 Enoki, golden enoki, shameji, hen of the woods, shiitake and eringii were accompanied red kale, purple carrots, seaweed and shiso leaf. This was the perfect introduction to some new varieties for me, which had been prepared in simple broths to retain their natural taste. RP felt the garlic slivers were overpowering at times, but I had no such issue being a garlic fiend. The meat main was roast pork shoulder, with mashed potatoes, wild mushrooms, crackling and purple sprouting broccoli; meaty by name and nature. 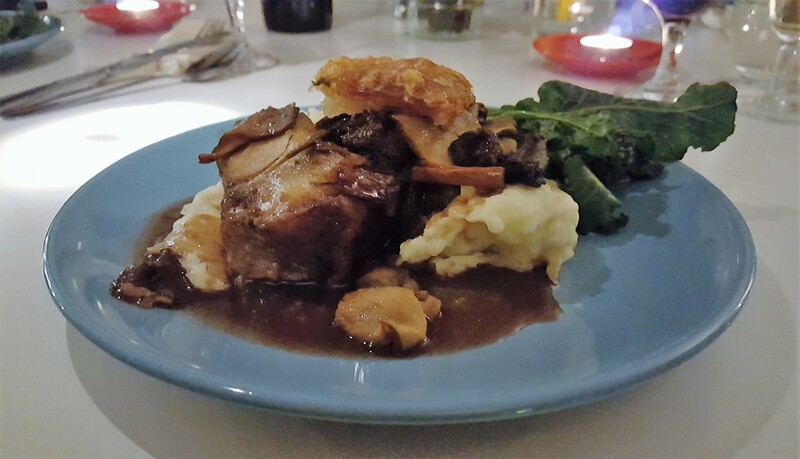 This sizeable serving was my favourite dish as it epitomised comfort food: firm pork on a gravy-coated mashed potato pillow, soft but slighter firmer textures and deeper notes from the broccoli and mushrooms then the crowning glory of the salty, crisp crackling. An Oxford Regatta red was the chosen pairing, ideal for those who prefer dry wines. Dessert got underway with Yorkshire forced rhubarb, elderflower and viola-topped chocolate. The artistic plating elicited many nods of approval around the table, as did the decadent taste of the chocolate, laden with double cream. We all paused midway to listen to Lucy’s impressive a capella rendition of Dusty Springfield’s “Son of a Preacher Man”; a food writer with many strings to her bow. 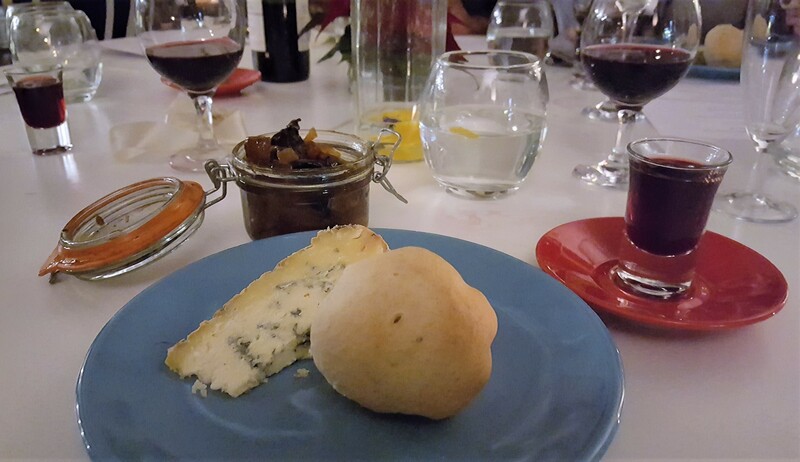 Sweet then stepped aside for its savoury counterpart: Dorset Blue Vinny and mushroom chutney, with a shot of Elderberry and Port Liqueur. The cheese was a revelation, starting off crumbly and strong towards the middle of the slice then becoming softer and mellower closer to the rind. Mushroom chutney was the surprise hit for me: chewy chunks in a spicy marinade. If, like me, you’ve never made chutney from scratch before and fancy giving it a whirl, the recipe is now online. As for the liqueur, it smelt much stronger than it tasted. 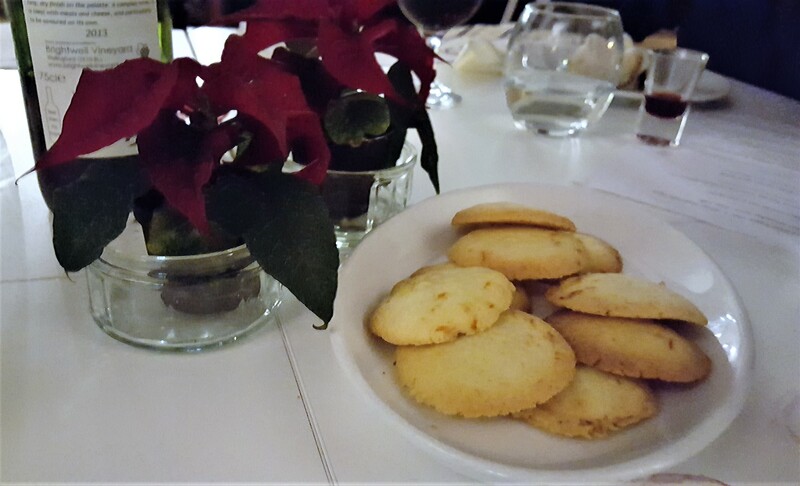 After polishing off 6 courses, the simple, svelte and snappy orange biscuits were the best way to round off the meal. We somehow hauled ourselves up and said our goodbyes to our fellow supper club diners, including Liz’s mushroom supplier, New Covent Garden Market-based Mushroom Man and co-writer Michael Hyams, her collaborator on their upcoming cookbook, The Mushroom Cookbook, to be published by Lorenz Publishing in March 2017 (available to pre-order on Amazon here). If you’d like to munch on wild mushrooms, make sure you follow @sdparties and @ecjokeefe on Twitter and Instagram for regular supper club updates. All recipes from the evening will be posted to the SDP website shortly. Want to know more about the suppliers? You can find the links to their sites below. Disclaimer: I was invited as a guest of Seasonal Dinner Parties’ Supper Clubs and did not receive any payment for this review. 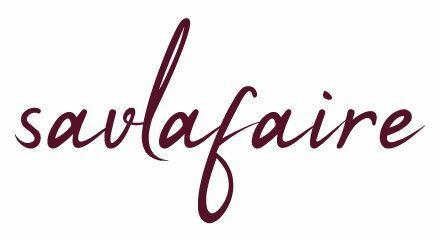 All views and photos are my own and remain a trademark of www.savlafaire.com. Right, that’s it, I wanna go foraging and I want to go now! 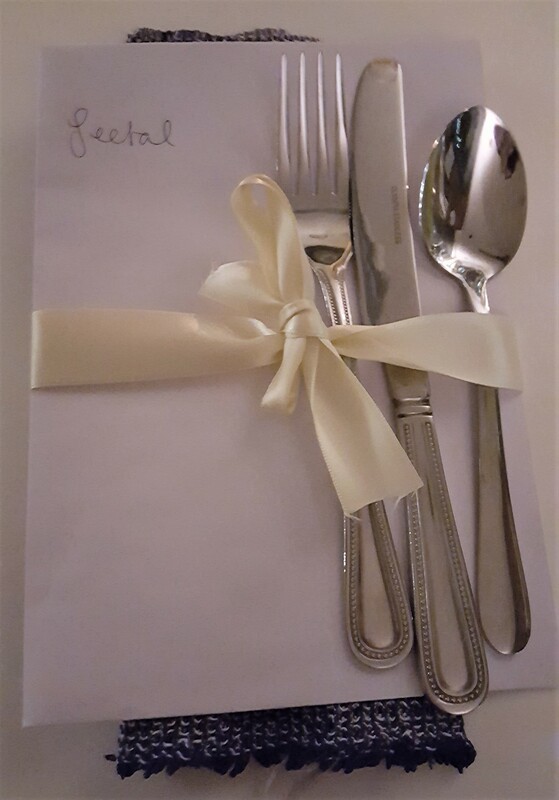 Amazing supper-club Seetal.. It was a great evening, and I wouldn’t mind joining you on that trip as have never been! You too, Tash – see you soon! Wow! I absolutely love mushrooms. This place is so for me. Thanks for finding! I’m so intrigued by the winter salad! It was a refreshingly different dish, and so tasty!